I like to use copper in my kitchen. For pots and pans, it conducts heat very well, and it looks great hanging from my pot rack. But copper tarnishes quickly and has a reputation for being hard to clean. When exposed to air, it changes color and develops a dark patina. When exposed to moisture, it develops a greenish-blue patina. On some things, the patina is quite desirable, but not on my pots and pans. I want them to be sparkling clean. Luckily, they aren’t as hard to clean as you might believe. If you’ve been avoiding using copper because you’re worried about how to clean it, this article is for you. 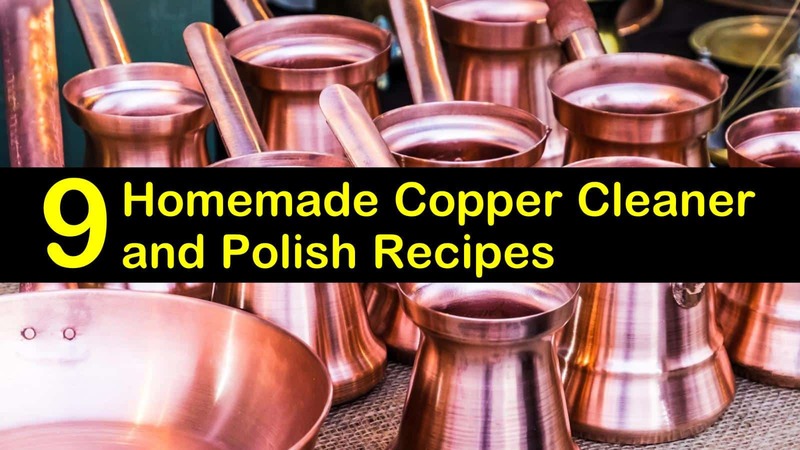 I have put together my best tips and recipes for how to make copper cleaner and homemade copper polish. 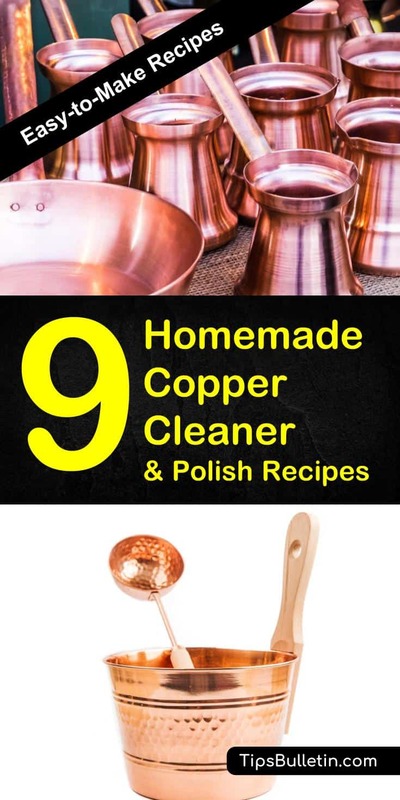 If you follow these recipes, you’ll be able to keep your copper shining using ordinary household products. And best of all, very little elbow grease is required. This DIY copper cleaner is the easiest way to clean your copper and one of the best copper cleaners for pot recipes. Mix 1 cup of white vinegar with 1 1/2 teaspoons of salt in a spray bottle. Shake and spray liberally onto your copper pots, pans or when you are cleaning a copper sink. Give it 30 minutes or so to work, then just rub it clean. You can repeat the process if some tarnish remains, but usually, one good cleaning is enough unless your tarnish has been building up for a long time. I like the spray version of this recipe, but if you have built up tarnish and need the vinegar and salt to cling to the pot for a long time, you can make this into a paste. This recipe works equally well for brass and copper. Mix these three ingredients to form a paste and spread it thickly onto your copper with a soft cloth. Give it a bit of buffing as you spread it. Place the item in a plastic bag or cover it with plastic wrap. Allow the paste to sit on the copper for a few hours or even overnight, then rinse it off. Dry the copper. Repeat if necessary. Cream of tartar is a mild acid and abrasive. Working together with the lemon juice, it is good for tackling tough tarnish and stains on your copper. Use this method only for very tough tarnish because the mild abrasive action can scratch your copper. Most days you will clean your copper pans like any other pot. Wash them in hot soapy water using a soft cloth or sponge. Rinse them and dry them completely with a dry towel. Water encourages tarnish, so don’t skip the drying step. Occasionally, you may notice a little discoloration on the copper pan, especially if it has been kept in a moist environment. When this happens, just give it a quick scrub with a salted lemon. The acid in the lemon juice will clean the copper, aided by the mild abrasion from the salt. Just give it an all over rub, don’t feel like you need to scrub. You don’t want to scratch the copper. Like copper, brass tarnishes over time and loses its original shine. However, many pieces of brass have a thin layer of lacquer applied to prevent tarnishing. If your item is lacquered, clean it with a soft damp cloth to avoid damaging the lacquer layer. For items with no lacquer, you can use the acidic liquids or a homemade brass cleaner dip to remove the tarnish. Rub any of these onto your brass and leave on for 10 to 15 minutes. Rinse the item and buff dry. This simple cleaner works great on most household items and to clean pennies and coins. If you need to clean in deep crevices, use a toothbrush to get the mixture into the crevice. On badly tarnished items, it may be tempting to grab a scrubby and some abrasive cleaner and apply a little elbow grease. Please resist the temptation. You will end up scratching the metal and destroying the surface of your item. If the tarnish is heavy, just keep reapplying one of the above cleaner mixtures until it is all gone. Copper tarnishes when exposed to air and moisture. To prevent moisture, you need to keep it away from these two elements. For small items, place them in a plastic bag. If you live in a high humidity area, add a silica-gel packet to the bag. For larger items, a thin coat of wax or oil will prevent air and moisture from tarnishing the item. Polish large items with olive oil, WD-40, or a thin layer of carnauba wax. Make sure it contains no abrasives or polishing agents. 9. What about Ketchup as a DIY Copper Cleaner? Many people use tomato ketchup as a copper cleaner, and it works on the same principle as the methods mentioned above. In my opinion, the acid in the ketchup is weaker than the vinegar or lemon juice, and it contains other ingredients that aren’t needed. If you don’t have vinegar or lemon, ketchup will do in a pinch. How Does Copper Cleaner Work? All of these copper cleaners contain acid and a very mild abrasive. The acid dissolves the tarnish while the abrasives help scrub it away naturally without scratching the surface. For tough stains or thick tarnish, more time may be needed or multiple applications, but it will work. What is the Best Copper Cleaner? All of these homemade copper cleaners will do the job, but my favorite is the salt and vinegar spray. It works on mild tarnish with no scrubbing. For tarnish build up or tough stains, try the DIY Copper and Brass Cleaner paste, cover the item to prevent it from drying out, and allow it to sit overnight. I hope that this article has helped you see how easy it is to keep your copper clean. There is no need to fear the tarnish. An occasional application of vinegar or lemon and salt while keeping them shiny for many years. Do you have a favorite cleaning method for copper or brass that I missed? If so, please share it in the comments section. If you found this copper cleaning tips helpful, please pin it or share it on your social media. Lets spread the word about cleaning copper so that future cooks will not hesitate to get this beautiful and excellent heat conductor.